To learn more about Chatype, visit the group's website at www.chatype.com. To donate to the group's Kickstarter fund, visit their page here. The curvature of the arm on the R is one of several aspects of the typeface that was influenced by Cherokee script developed by Sequoyah in the early 1800s. The slab serif feature is a nod to industrial Chattanooga. "Slab-serif fonts were commonly used in industry in the 1950s and '60s," said Jeremy Dooley, one of the type designers working on the project. "It's heavy and it has a lot of impact." The typeface has square geometric elements, which are meant to evoke Chattanooga's burgeoning technology. Chatype designers still need to finish the following tasks before the font is finished. Chattanooga, like most cities, has its signature vistas, its signature homespun products and its signature hole-in-the-wall restaurants. But unlike any American city, Chattanooga is on the verge of having its own signature: a unique typeface created by a group of designers who hope to see it emblazoned across everything from city brochures and local menus to bike lanes. For the last several months, the designers have been developing "Chatype," a typeface of characters especially developed from the city's character. "There's immediately a vibe when you go to a city," said Jeremy Dooley, one of the type designers working on the project. "The task is expressing that in a typographic form." Once complete, the font would be free for exclusive use by Chattanooga city residents, agencies and businesses. Dooley, who owns Insigne Design, and fellow type designer Robbie de Villiers, owner of Wilton Foundry, are two of what is estimated to be fewer than 300 full-time type designers in the world. Both have developed typeface families for organizations throughout the U.S. and overseas, and each moved to Chattanooga in the last year. Though the idea of a Chattanooga font has been kicked around by local designers for years, the wheels for Chatype started spinning when local graphic designer DJ Trischler, with branding firm D+J, met with Dooley for the first time. 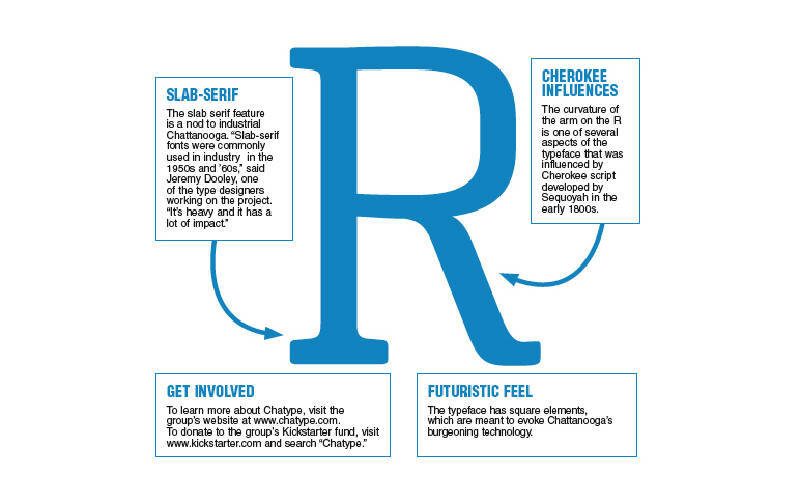 At the end of their meeting Trischler blurted out, "Have you ever thought about designing a typeface for Chattanooga?" Dooley promptly replied, "Of course." He then told Trischler about de Villiers - a designer and branding guru who has created logos for products like Crush soda and Canada Dry ginger ale. They contacted him about the idea, and he was in. "It's really a matter of the stars aligning that we have them both here," said Trischler during an open forum held last week to explain the font and gain input. In November, the designers workshopped the font in the entrepreneurial startup event 48-Hour Launch. There they nailed down a prototype version and a marketing strategy. Chattanooga City Councilman Andraé McGary met de Villiers and Dooley at the 48-Hour Launch and immediately latched onto the idea of a city typeface. "In a font, the character of a city comes through in a different way than it does with images," McGary said. "It develops a unique voice." McGary said once the typeface is finished, he wants to introduce it to the City Council in hopes that it will be "officially" adopted by the city. But the Chatype group is seeking its main support from the public. In the typeface's last stages of development, the group is looking for public input and public donations to help bring the font from the studio to print. On social media and in question-answer sessions like the one last week, the group is trying to make the case for the value of a font, and why this one is so special. The idea sounds impossible: Capture a city's soul, then translate it into an alphabet. "It's a little tricky, because obviously a city is a complicated, multifaceted, living organism," explained de Villiers. "We decided we wanted to look to the future, but respect history. It's an evolving city." Before starting work on the typeface, Dooley and de Villiers made a log of the landmarks, logos and linear themes found in Chattanooga. The designers scoured the city for traditional associations with Chattanooga: railways, the Choo Choo, Rock City and Coca-Cola. They then listed images and brands more recently associated with Chattanooga: Volkswagen and other manufacturing plants, the city's touted fiber-optic high-speed Internet network, and the area's growing reputation as a hub for outdoor sports. They reviewed the collection of signs and shapes, looking for common themes or striking elements. To create the typeface's skeletal dimensions, de Villiers turned to one of the city's most iconic landmarks: the Walnut Street Bridge. "I was driving over Veterans Bridge and I looked over at the walking bridge and noticed its proportions. It was just perfect," said de Villiers, who used the Walnut Street Bridge's "golden proportions" to map out the shape of the characters. Another major breakthrough was incorporating Cherokee script, which was developed by Sequoyah in Northeast Alabama during the early 1800s. "The language's written forms were invented just about 50 miles or so south of here," said Dooley. "So we thought that would have a really interesting impact on the typeface. And it remains." Both designers drafted their own versions of the font. Dooley's was heavily influenced by the Cherokee script with curls and flourishes, while de Villiers' had a more contemporary feel with sharp angles. Over a slow process, they merged their ideas to form what they call a fusion of the organic outdoors and modern, mechanical power. It's a font they say fits with the moniker "Scenic City" - but also "Gig City." The printed type we take seconds to glance over was developed with painstaking attention to hundreds of tiny details. To gain mastery of their craft, type designers must study every nook and cranny of letters and how they are shaped. This article has been published in a font called "PoynterOSTextTwoL-Roman." It's a serif font, which means the letters are capped and footed by short lines. On our web site, www.timesfreepress.com, the article has been published in "Arial" - a common sans-serif font stripped of any embellishments. Chatype is most easily described as a "futuristic" slab-serif - meaning the serifs are more thick and boxy. But de Villiers is quick to point out the Cherokee influences that soften the script. "Every character is somewhat rounded," explained de Villiers. "That's to give it warmth, because Chattanooga is a warm city." Chatype will have four weights, or levels of "boldness," meaning hundreds more individual characters have yet to be designed. As they work to finish the basic Chatype design, Dooley and de Villiers envision a collection of Chatype "breeds" spawning from the original, with different stylings used for different neighborhoods, businesses or brands. As the buzz about the typeface has circulated, the designers say they have gotten plenty of puzzled reactions. What difference does a letter's shape make for a city? Paul Rustand, creative director of design firm Widgets & Stone, argues that even small, subtle things like fonts foster a city identity and civic pride. "It's a great cultural thing and a great tool in the toolbelt for communication," he said during the Chatype forum. There's also the practical element of giving the font to public agencies and nonprofits that don't have to pay for a license, Trischler said. Trischler also touched on the city's competitive edge. "If we're going to be one of the top cities to visit, we need to consider things like signage. If someone's in the airport, do they feel like they're in Chattanooga?" Stephen Culp, co-founder and CEO of local marketing company Delegator.com, founder and chairman of Smart Furniture and co-founder of Causeway.org, said the time is ripe for a unifying feature such as a typeface. "Chattanooga doesn't need a font, but it didn't need square hamburgers; it didn't need fizzy drinks in a bottle. But those things were transformational," Culp said. "And I think we're on the verge of a transformational decade in Chattanooga." For a simple sans-serif font, a type designer typically can charge a starting price of $10,000. Chatype easily could run up a much higher bill, its designers say. But besides minimal funding, the designers say the project is a labor of love. The group is using grassroots fundraising website Kickstarter.com to raise $10,000 that will go toward production costs. The reasons for using Kickstarter are several. The website - which allows individuals to make investments ranging from one to thousands of dollars - serves as a barometer to gauge public interest. lt also promotes a sense of community ownership. "We could petition our local politicians to make this happen from on high. Or there's the other possibility of trying to grow this organically," Dooley said. The format also promotes more discussion and feedback as the typeface evolves, explained Jonathan Mansfield, account manager with D+J. "We don't want to develop something ... then everyone say, 'Wait, I had no part in that. I don't want that, and besides, what about these 40 other things?'" Mansfield said. During the Chatype forum, several people spoke up about not liking different versions of the font. "Right away I was not a huge fan of the typeface," said Chelsea Conrad, a graphic design student at the University of Tennessee at Chattanooga. "It's hard to gauge whether the actual typeface has grown on me, or that knowing the background of it changed things - but I do really love it now." If the Kickstarter fundraising goal is met, the designers say they could have the typeface ready for use in a month's time. Designers and businesses already have sent in requests for prototypes. The Chatype group also has polled city development agencies and downtown attractions to gauge interest. "We're interested in learning more," said Dave Santucci, vice president of marketing for the Chattanooga Convention & Visitors Bureau. "I think working together to make sure we're all speaking from the same page to promote Chattanooga is something [city agencies] have always done. The idea of all using the same font to do that is a completely new idea." Success does not hinge on whether public agencies adopt the font, the designers say. They will feel gratified if they begin seeing the typeface slowly trickle into local shops, restaurants and design firms, just so long as it's out there. "We don't want this to be an intellectual curiosity," Dooley said. "We want it to be embraced and used."